I sure hope you all had a wonderful Fourth of July celebration! If your not in the U.S, I hope you had an amazing weekend! I took the weekend off from blogging to spend with the family, and get a few much needed things taken care of. Most of our house stays in order, and relatively clean on a daily basis. HOWEVER, there are few spots that seem to be what I would call "weakest links" in my cleaning routines. William James once said "A chain is no stronger than it's weakest link, and life after all is a chain." Pretty profound is it not? What if we adapted that same theory to every area of our life? Like, a clean home is only as clean as the "weakest link" (or unclean)! A couple of weeks ago the twins got a new bunk bed which meant a bedroom overhaul for them! Thanks to the help of all three kids their twin beds got taken apart, the bunk-bed put together and furniture rearranged. Then... momma got sick, and one of the twins got sick. BUT.. all came together again and we completed deep cleaned their room, de-cluttered, went through clothes that are being passed on to some friends, and organized. I told them if they kept it picked up, I didn't mind making their beds, and vacuuming the floors when I vacuum the house (sometimes daily, sometimes every other day depending on the traffic in the house). For two full weeks they have kept it up very easily! We are very proud of them because it only takes 21 days to make a habit and they have gone 14! There is hope!! That is ONE week link taken care of! Saturday we had plans for the evening, but our teenage daughter left in the morning to go to the beach with some other neighbor friends. I had told her the night before that I was going to clean her room while she was gone and she said "Okay." . Not like I was asking for permission but I wanted her to know that I was going to be in her space and do what has been needed for MONTHS! When she came in to get her swimsuit I was reminded of what I had told her (apparently a good night's sleep can make you forget some things you said) and knew that I wanted to stick to what I said. This was my chance, because I knew she would be gone for hours. I didn't realize it would take me five full hours to tackle that space. The good news... she is thankful, and I again tackled one of those weakest links. That is indeed where the thought came from in the midst of mess that our home is really not clean if we have a room that is completely out of control (aka a weak link). Same goes for saying your cabinets are organized ... yet you have a junk cabinet or one that overflows with Tupperware dishes! That is ANOTHER week link taken care of! This week outside of really buckling down on working on writing my current book, I plan on tackling one last weak link ~ the GARAGE! It comes around every couple of months (about quarterly) the need to de-clutter and rearrange! This theory really does apply to every area of your life but I am just sharing as far as taking care of our homes. 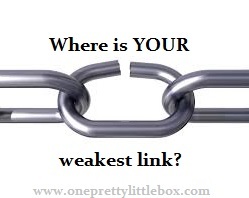 I challenge you today to make a list of some of your "weakest link" areas and choose to start somewhere! You might check out the post I posted for last Monday's motivation post that discusses out how to optimize your priorities to help get you on track and figure out where to start! I can't wait to hear your thoughts on those weak links in your home keeping and the creative ways you find to tackle them! Please feel free to post down below in the comments or ... come talk about it on our FACEBOOK page! 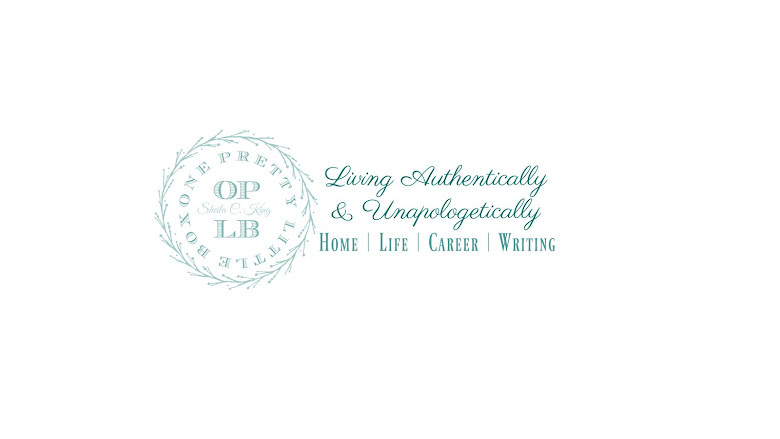 If you haven't stopped by and clicked "like" I invite you to do so! Thanks for stopping by the blog today! I will have a fast and easy breakfast (or snack) recipe for you tomorrow so be sure to come back!